Datamars has a profound understanding of the key issues surrounding textile identification. With years of experience, Datamars has designed the most complete portfolio or RFID-based solutions for every application of textile identification. FT-401-ST / FT-401-PA / FT-401-Pouch. New disruptive UHF generation transponder: the best bulk-reading performance and endurance in the hashest laundry conditions in a reduced form factor! Discover more! Available in 3 versions: Source Tagging (sewn), Patchable and in Pouch. FT-301-ST / FT-301-PA / FT-301-Pouch. The first multi-read UHF LaundryChipTM developed by Datamars for high-volume bulk-read applications: flexible, round module. Available in 3 versions: Source Tagging, Patchable and in Pouch. High-performance RFID transponder for tracking of laundry carts, with rugged design and blue ABS housing for high durability. Available in 2 versions: ETSI or FCC. UHF Stationary Reader, available with 1, 2 or 4 ports. Readers are also available with Cloudburst, a software layer developed specifically by Datamars for the laundry needs: discover more. UHF Handheld Reader, Cross Dipole, WLAN, desktop charger. Portable UHF reading solution with Bluetooth connectivity. 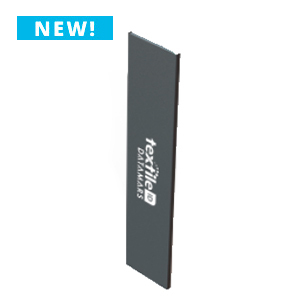 Low profile, high-performance 4-port UHF RFID reader designed for both indoor and outdoor applications. Easy to install, unobtrusive, integrated 2-port UHF reader/antenna designed for office and commercial environments. w cost platform for developing and deploying interactive read/write applications. UHF hanging conveyor antenna to precisely identify UHF tagged textiles thanks to an homogenous reading area. UHF Conveyor Antenna, Right-Hand Polarized. A-UHF-TT-AO-101: UHF Add-On Antenna, TableTop. A-UHF-TT-CBO-101: LF-UHF Combo Antenna, TableTop. The UHF Portal Plus has been designed to read carts on the clean side and it can be used in any area were bulk reading is needed without slowing down the textile flow. The UHF Open Tunnel has been designed to be mounted on any existing laundry conveyor belt and it’s the perfect reading system to read clean pack of textiles. Light and dismountable UHF manually operated single door cabinet, suited for space limited applications. Easy & quick to install, Litecab is available in two versions: small and large. Tailored for UHF readers and reading systems, Datamars Cloudburst software has been designed specifically for the laundry environment. Discover more. HF Transponder, 100% PPS material. OEKO-TEX® Standard 100 CERTIFIED: discover more. Stationary reader (2W, serial & USB port). Stationary reader, MC with 9x antenna connector. HF Handheld Antenna for identification on hanger. HF Multiread Table Top Antenna. Large HF Multiread Table Top Antenna. HF Multiread Tunnel Antenna with conveyor belt and cart, IP66. NMS Stationary Reader with NMS. Handheld Antenna for identification on hanger. Table Top Antenna with CNCS.